I’ve got some nice photos shared by readers over the past months, which I’ve been wanting to pass along to you. We’ve also got one piece of writing. Here we go! 1. 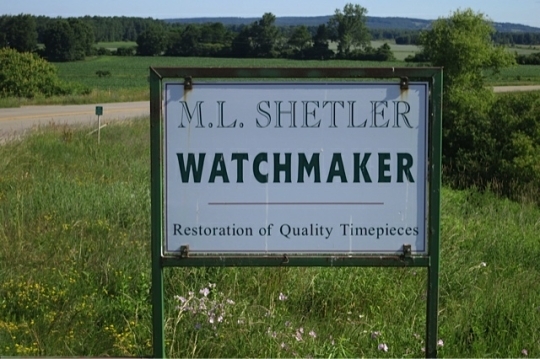 Amish Timepiece Shop – First of all, long-time readers might recall a 2012 post on Mahlon Shetler’s Clock & Watch Shop in Dayton, NY. 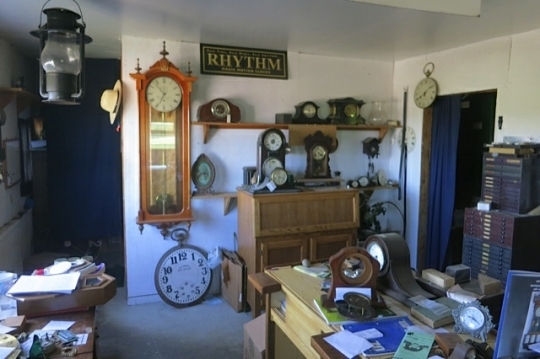 Mahlon does a lot of high-end work on clocks and other timepieces including pocket watches. Love the look of that shop. I used to live in Chautauqua County a few years back and visited Mahlon often. He made pocket watch parts for me and also repaired the more complicated issues for me. Mahlon and his workers called me the wind-indicator man because I took him a Waltham Vanguard size 16 with 23 jewels and the wind-indicator option for repair. He made a new pallet fork for me and serviced and timed the watch. As always he did outstanding work. 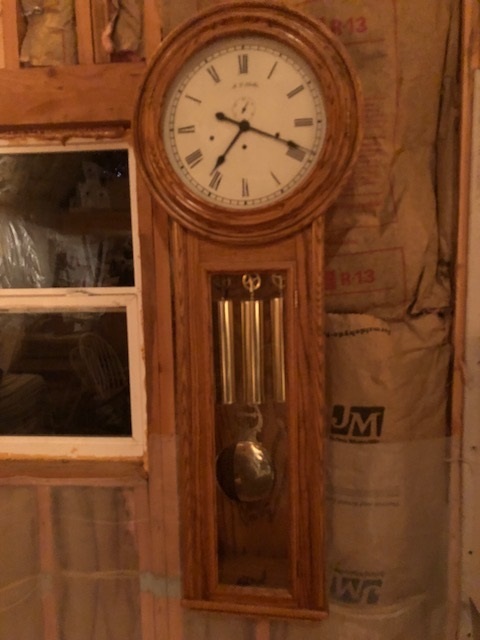 I purchased a 3 weight wall clock from him that he made for someone that did not end up buying the clock. I still have it and it still chimes away every 15 minutes. 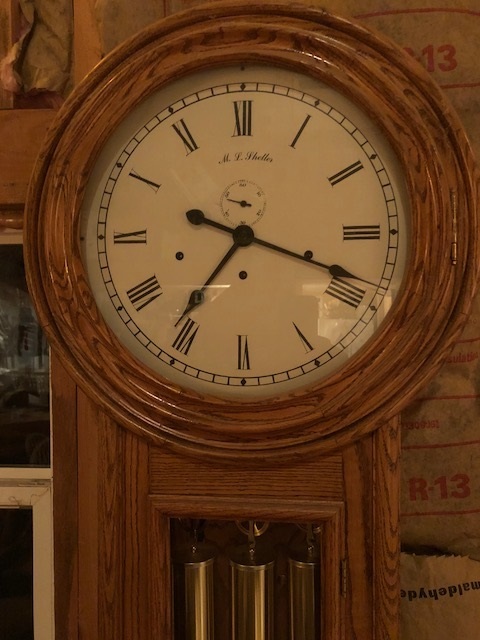 It is an amazing clock. I miss going to see him. You won’t find a nicer man or a better watch and clock maker anywhere. 2. William Penn Letter – The first Amish settlers in North America came to William Penn’s land in the 1730s, following an opportunity to own their own property and live in religious freedom. Penn realized those coming over would need a lumber mill & grist mill and Penn asked his good friend Caleb Pusey to build same. They put a pre-fab mill in the ship WELCOME as ballast & Penn & Pusey came over together on that ship. We have an original land document signed & sealed by Penn (attached). One of our Amish friends also has a land document signed by Penn, but I have never seen it. Caleb Pusey’s house still exist in Upland, PA, but the mills are gone. Amish in Europe were mainly tenant farmers, not owning the land they farmed, and had endured a long history of persecution for their Anabaptist beliefs. The chance to farm one’s own land in a religiously tolerant atmosphere must have seemed like a dream. Today Lancaster County is the oldest Amish settlement, having been founded around 1760. However, a handful of Amish settlements existed before Lancaster County, including in Northkill (Berks County) and Malvern (Chester County). 3. 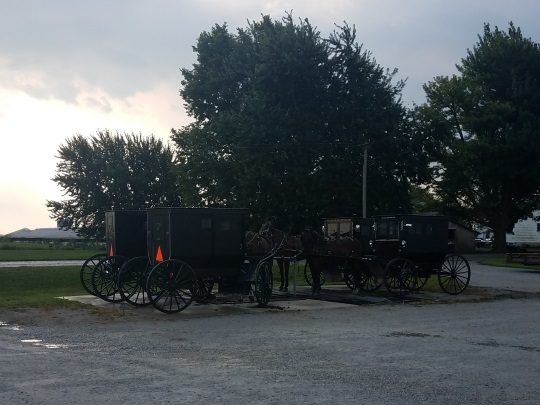 Arthur, IL Visit & Mennonite Auction – Reader Lee Annette shares her visit this past summer to the Amish community at Arthur, Illinois. She sent enough about the visit that I thought I’d publish it as its own post. But for now here are three shots from her trip. 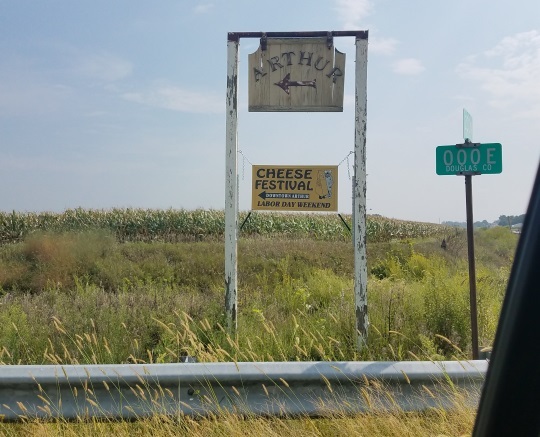 Arthur was the first place I really got to know the Amish, so always happy to see anything from that community. 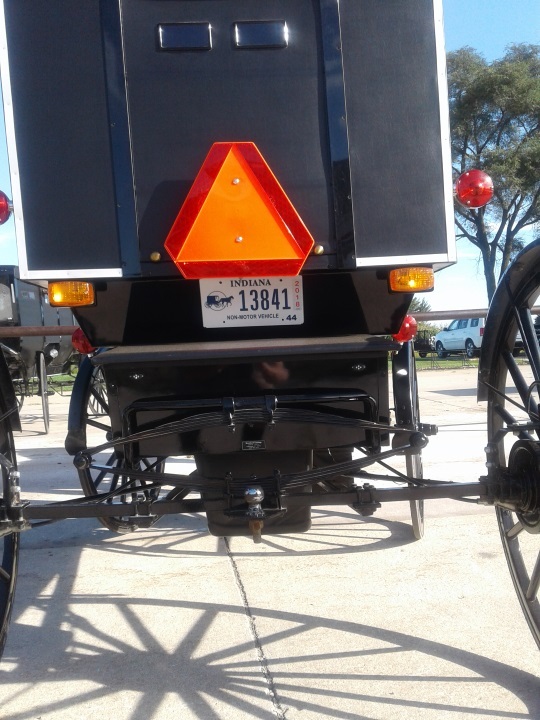 This plate is a bit different from others, with its Amish buggy silhouette/logo. An important part of a recent vacation was spent in the Lancaster Pennsylvania area—also called “Amish Country.” When I lived closer, visits to the area were frequent and I developed a familiarity with the area. So this was an interesting opportunity to return after a decade of absence. There is much truth in the saying, “The more things change, the more they stay the same.” While there were some obvious changes to the area, it was equally obvious that many things have not changed. I have always avoided the heavily trafficked tourist areas and never shared the common perspective that Amish folks are a tourist attraction. I have always considered myself a guest among these special people. One favorite back road farm stand had not changed much, although the attendant was now a nine year old Amish girl working alone indicating a new generation is now involved. She was pleasant and efficient, totaling up our purchases using a simple calculator. When I presented her with an unusual combination of bills and coin she pushed the calculator aside, took my offering, and counted back the correct change without hesitation. Watching her box our purchases cheerfully and carefully in the hundred degree heat was humbling. I can’t help but contrast this with another experience several days prior. We ate at a restaurant where some of the servers were perhaps nearly twice my Amish friend’s age. Several of them couldn’t stop texting (or talking) on their smart cell phones while they were walking between the kitchen and their customers’ tables. They of course used computers to document our order and calculate our final bill. I did not test our waitress’s change making ability—credit cards have eliminated that need anyway. 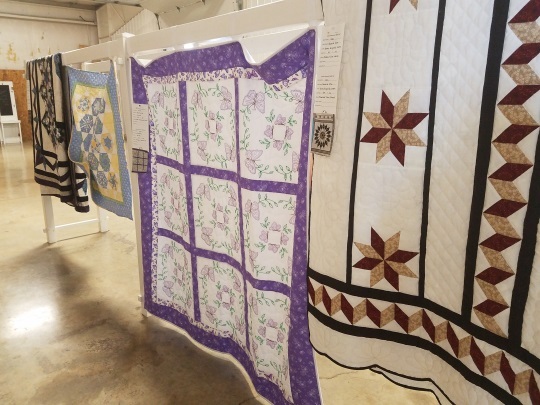 The Amish are also among one of the most misunderstood groups of people, often considered “backward” and “out of touch.” The point of this contrast is not to demonstrate that–the point is quite the contrary. I would offer that the Amish are actually quite progressive. What makes them “different” is that they are selectively progressive. (Remember, my young friend did use a calculator for part of the transaction. Not long ago a brown paper bag and pencil would have been the tool of choice.) The important distinction between the Amish and society in general is that the Amish only embrace technology after careful and deliberate consideration of the impact it will have on individuals, families, and the community. One of my frequent observations that might parallel this is “just because you can do something, that doesn’t mean you should do it.” We are inclined to want the latest and best. Technology offers lots of temptations. Why watch that old TV when you can have a wide screen? (The Amish question might be “why watch TV at all?”) Only a few months to go and I can upgrade my smart phone to one that’s even smarter! The possibilities are endless, really. While it would be possible and perhaps be nice to be able to order online from that farm stand in Pennsylvania (they make incredible pickles), I’m willing to concede that for this Amish family to embrace that technology would require some major changes in their lives. And for me it would mean that a visit a few years from now not only wouldn’t be necessary but wouldn’t be possible. Call me backward and out of touch, but I’m not ready to give those visits up. Reprinted from: Boomsma, Walter. (2013). Small People — Big Brains: Stories About Simplicity, Exploration, and Wonder. Abbot, Maine, U.S.A.: Abbot Village Press. There could be a somewhat sad epilogue. Recalling this was written in 2013, the last time we visited the farm stand was gone, replaced with parking for the expanded furniture shop in the back. If you’ve got Amish-related stories or photos you’d like to share, I’d be happy to hear from you. Drop me an email at ewesner(at)gmail.com. Thanks to everyone who shared. That land document and story are great! I have a copy of a land grant to my ancestors signed by John Penn. My ancestor, Benedict Lehman immigrated to Pennsylvania on October 8, 1737 aboard the”Charming Nancy “ to Philadelphia. He lived in Northkill until about 1773 when he purchased land in Bedford County (later Somerset) and that is what the land grant was for , Bedford County 300 acres in December 1773. It is fantastic that these bits of history are preserved. Neat that you know your history back so far, Scott, and to have a tangible tie to that past. I bet that grant doc has a lot of personal value for your family, neat that you have it. Just out of curiosity, do you know would a document like that also have significant financial value? I could see the value for history buffs and collectors but I really have no concept of how many of them there may be out there. I was wondering about the stand that the writer talked about as I’ve also noticed that sometimes they close between my visits. I believe I know the one of which he speaks as I really hated to see a particular stand close which had a furniture shop behind it. I would fill a box or two of their canned goods to bring home and everything was good. They also sold all kinds of baked goods, it was always a favorite stop. Was it on one of the main roads like 340? I love that saying Erik “Just because you can do something, that doesn’t mean you should do it.” I wrote that one down. And Scott, great that you have that early document….. Some good wisdom there Bob! Erik, I have a copy… photocopy of the document. The original is in the Pennsylvania Historical and Museum collection in Harrisburg Pa. Yes it is very cool to be able to trace my heritage to Amish immigrants from Rotterdam to Philadelphia to a land grant in Northkill to Somerset County Pa. One of my ancestors was appointed Overseer of the Poor in Bedford County in the late 1700’s! Really neat to hear, Scott, and that your ancestry line goes through Somerset County. That is one of the most interesting of all Amish settlements I’ve visited. When I was in Lancaster County last month we were doing some reading, a few sons of my Amish friend were in the room and one pulled out one of the genealogical books, and started tracing things back to show me all the way to the 1700s. I think being able to do that as an Amish person and to know your heritage and where you came from – going so far back – probably gives added weight and appreciation for one’s faith. I believe your John Penn was the Proprietor to PA from 1771-1776. He was born in London & married Mary “Polly” Masters in 1772. He had a brother Richard (1735-1811) & his father was Richard Penn Sr (1735-1811) one of the sons of the famous William Penn. I have a picture of John if you don’t have. Quakers kept such great records ! I just found John Penn on line…..
Bob the Quaker, hello Bob thanks for the information. I don’t know where you live but I was in Pennsylvania photographing old barns, covered bridges etc. and a friend took me to an old Quaker meeting house in Berks County. Exeter Friends Meeting, established in 1725 near Oley. The stone Meeting House was built in 1759 replacing a log one. They were doing a cleanup day and let me photograph it inside and out! It was an extremely off the charts experience! Do you know of this? It was reopened in 1949 for Worship after closing in 1899. I also do a lot of photography, especially around Lancaster, PA where we have a small summer place. We go every spring & every fall for about 5 weeks. We live in Texas (my job did it to me :-). 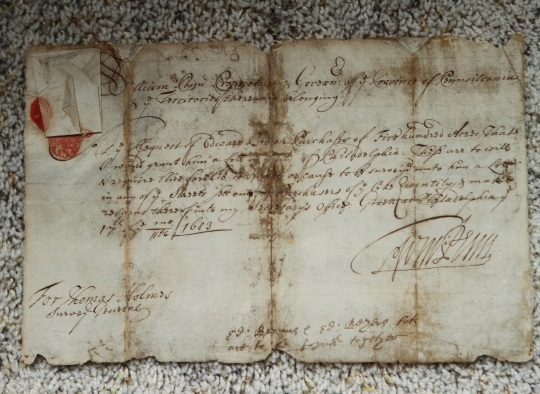 My research has shown that an original Land document signed by William Penn can go for $5,000 to $10,000. The person that the land was surveyed for makes a difference…ie. a relative or friend of Penn’s would be higher than an unknown, and knowing the history of the person who purchased the land also increases value.